Canaletto always admitted that he preferred life at home in his native Italy. However, in May 1746, economic necessity forced him to travel to London to seek his fortune amongst the wealthy aristocracy, many of whom he had already met in Venice when they ‘dropped by’ on their Grand Tours. 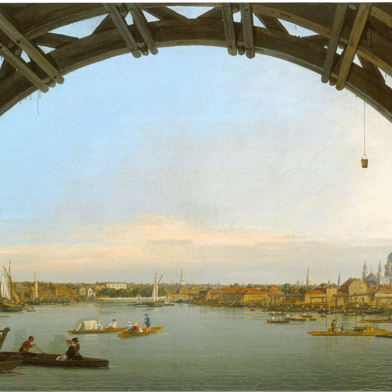 Canaletto arrived at the perfect moment, with London just on the cusp of reinvention into a modern, vibrant, thriving city. Those who had bought his Venetian views soon wanted their splendid town houses captured on canvas in the same manner. Canaletto’s pictures of London provide a magnificent overview of 18th Century architecture and the humdrum life of its inhabitants.